How can you engage better with your audience? Look at past posts and which worked the best. Tag people in photos – only photos that apply to them, do NOT abuse this! Keep a balance between different types of posts. Use a content calendar, post at least one per day. Choose a category. Help people understand what your Page is about by choosing the most appropriate category. Use a name that accurately represents what this Page is about. Match the name of your business, brand or organisation. Pick topics that relate to your business. A customised web address for your Page makes it easier for you to promote your presence on Facebook. If you add a valid address, people will be able to see and check in to your Page. This brief summary of your Page will appear below your profile picture. The limit is 155 characters. This is an optional field. In certain countries, such as Austria, Germany and Switzerland, businesses may be required by law to include a statement of ownership on their web presence. Provide some more information about your business, brand or organisation. Include details like your background, mission or awards. 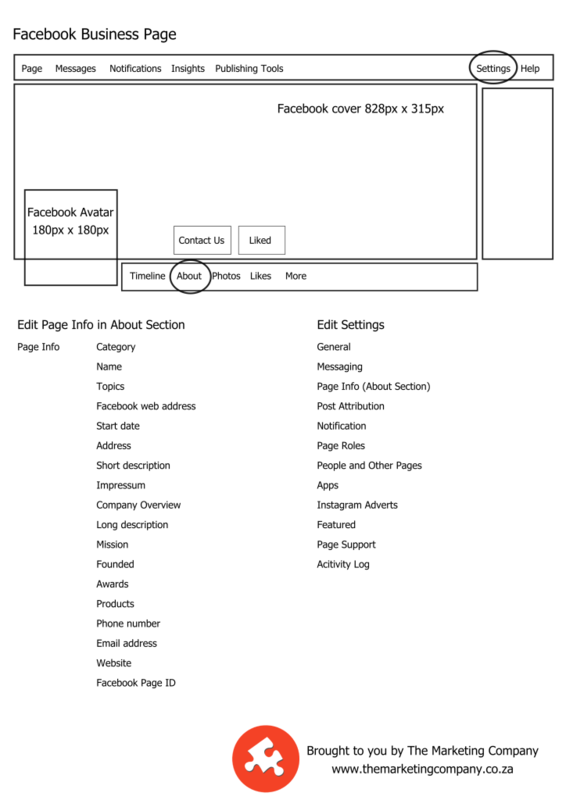 Adding your Page to your favourites will make it stay in the top-left of your home page. Publishing your Page makes it visible to the public. If you tick un-publish, it will only be seen by people with a role on the Page. Verified Pages appear higher in search results. Allow posts, photos and videos, review or disable. Let’s you assign interest-based tags to identify people who are most likely to engage with your posts. Also lets you restrict the visibility of your posts based on audience location, language, age or gender. You can select a date and time when your post will automatically be unpublished. When a post is unpublished, it is no longer visible to the public, but it is not deleted. Page managers can still view unpublished posts and their insights. Allow people to contact my Page privately by showing the Message button. Allow others to tag photos and videos published by Business4Women. You can choose to show your Page only to people in certain countries, or to hide it from people in others. If no countries are listed, your Page will be visible to everyone. When you select an age restriction for your Page, people younger than this won’t be able to see your Page or its content. To cut down on inappropriate content, you can add keywords that you’d like to block from appearing on your Page. If one of these keywords is used in a post or comment, it will automatically be marked as spam. A Page admin can approve or delete the content. The limit is 10,000 characters. You can choose whether to block profanity from your Page, and to what degree. Facebook determines what to block by using the most commonly reported words and phrases marked offensive by the community. Choose whether your Page is recommended to others. Your post will be shown to your followers in a language that is most relevant to them. Comments and likes will be added to the same post. Comments with the most likes or replies will appear first below your posts, as will comments from other verified Pages and Profiles. If this setting is not ticked, your Page will display the most recent comments first. Response time and Instant replies. Post as your page or yourself by default. When you’re creating or replying to a post, you will still have the option to post as yourself or as another Page that you manage. Admin, Editor, Moderator, Advertiser, Analyst. People and pages that like this page, and are blocked. Up to five Pages that you’ve liked can be shown as featured, and are rotated. Their personal information will be publicly displayed in the About section of this Page. This Page will be shown on their personal Profile.